For those of us who have accepted that IaaS (infrastructure as a service) is all about utility provision of a commodity then innovation is not about the interface but should be above and below the interface. Above the interface, this is all about the creation of novel higher order systems in much the same way that utility electricity enabled television, radio, consumer electronics and computing. Below the interface is all about operational improvements (efficiency in production, distribution of production etc) which normally manifests itself in price vs quality of service. This is the tune which I and many others have been singing for the last six years and +Randy Bias 'open letter' on OpenStack and AWS compatibility is just a reinforcement of that point. However, others sing a different tune. They believe that innovation of the interface is paramount. They believe that what matters is the interface, they hence strongly oppose adoption of AWS APIs. It's akin to a constant argument over what voltage and frequency electricity should be provided at rather than concentrating on development of higher order systems or operational efficiency. +Robert Scoble 'open letter' on Why OpenStack shouldn't focus on AWS compatibility is very much of this ilk. I cannot reiterate more strongly that was doesn't matter is innovation of the interface and so it's better to simply adopt the dominant interface and instead focus on above and below the interface i.e. concentrate on operational efficiency in provision of good enough components or the creation of higher order systems (see figure 1). The same was true with electricity, nuts and bolts and a vast sway of other activities that evolved to more industrial components over the last three hundred years. 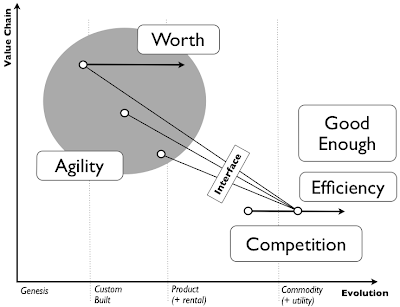 From the figure above, competition (demand and supply) drives any activity to a more evolved state e.g. commodity and utility. Provision of an activity as a good enough commodity component is not just about efficiency but also via the provision of a standard interface it enables the rapid development of higher order systems where new sources of value (i.e. worth) are created. This effect is known as componentisation and occurs through economic, technological and biological systems. As an activity evolves to more of a commodity / utility then the focus should ideally be on operational efficiency behind the interface and rapid development above the interface. 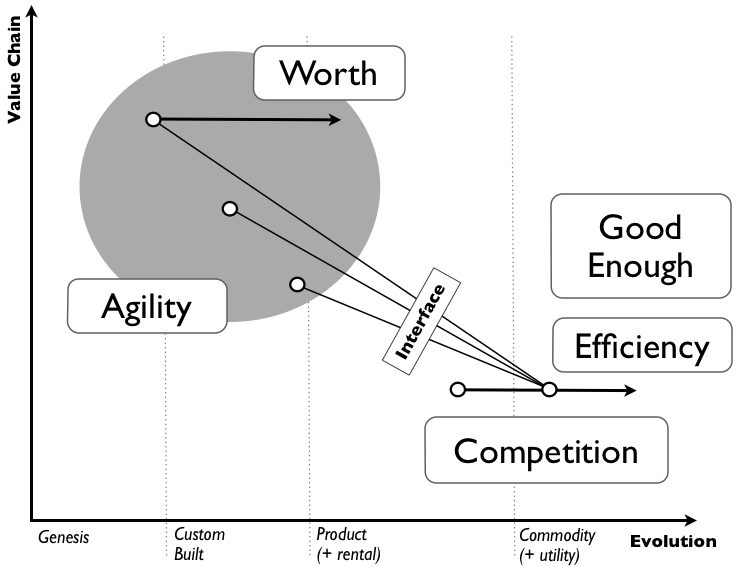 A constant focus on 'innovating' the interface diminishes both operational efficiency and agility in building higher order systems by introducing additional costs of change and should only be undertaken when there exists a clear reason why the interface is not good enough. Given widespread adoption of the AWS APIs, there doesn't appear to be a clear case for the AWS APIs not being good enough. Focusing on differentiation of APIs against a dominant and growing ecosystem rather than adoption of the APIs and focusing on operational efficiency seems like a losing strategy. Maybe I'm missing something?